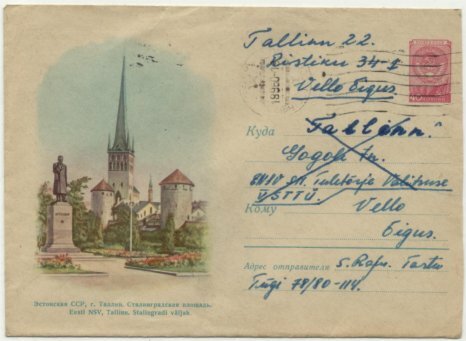 Postal stationery, issued 1959, 19 November, with the monument for M. Kalinin in Tallinn. But the place is, according the subscription, 'Stalingradi väljak, Stalingrad-square. 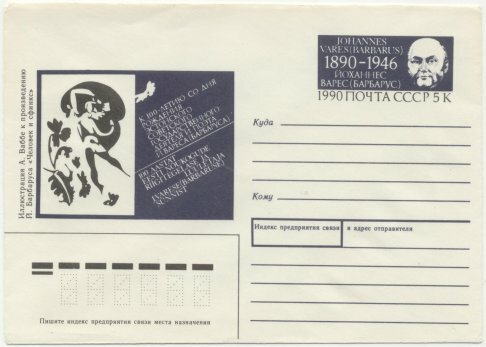 Subscription with Stalingrad-square. With the of the Stalin-glorification 1956, and with the de-stalinization in 1961 many places with his name get another name. 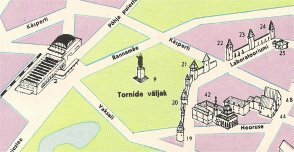 M. Kalinin is then situated at the 'Tornide Väljak', Square of the Towers. So it was called also before World War II. 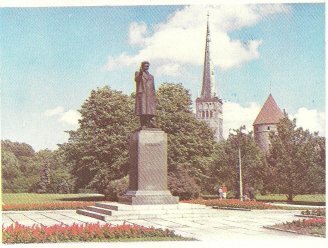 Also other known Soviet-heroes had a statue in Tallinn: Lenin and Kingissepp. Early in the nineties all these statues are disappeared from Tallinn. 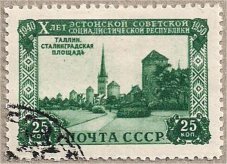 On a postage stamp of the Soviet-Union - resized 50%- , Mi. 1503, we see also the indication 'Stalingrad-square. In the (German) travel guide of H. Taliste, you can find a picture of the statue of Kalinin and further information about him: this 'Marxist und Revolutionä' worked from 1901-1904 in a electrotechnical factory in Tallinn, which later get his name. He organised the marxist labour-unions and founded illegal printing houses. A card - postal stationery- with the picture of the park. On the other side the description is not longer Stalingradi väljak, Stalingrad-square., but 'Tornide Väljak', Square of the Towers. The adress-side with the imprinted stamp. The card is issued 16/III 1962. In the book of Harald Vogt und Max Kromm is published a list of cards -postal stationeries- with Estonian motive. This is the second card on the list. In the Michel Ganzsachen Katalog Europa bis 1960 (cop. 2008) the picture postcards as postal stationeries are divided in 'einseitige Bildpostkarten' (one-sided picture-postcards, with picture left on the address-side) and 'zweiseitige Bildpostkarten'. Here we have to do with the 'zweiseitige Bildpostkarten': one side for adress, message and imprinted stamp, the other side for the picture. Michel has a division according the imprinted stamp: stamp of the series permanent postage stamps. This card has as imprinted stamp a stamp of the 10th series permanent postage stamps with year 1961. For the postcards in this period is used the stamp with the starting rocket. type II: offsett with fine lines for background and moon. type III: offsett with fine lines for background and moon without lines. On this card we are dealing with type I. 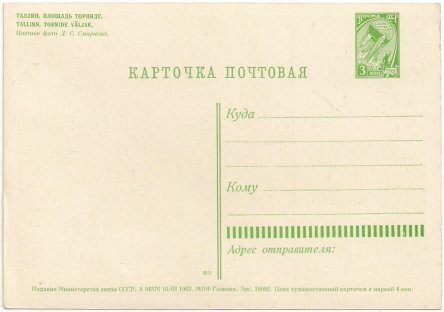 In 1961 with coat of arms in the middle above the breakline between the address data and written message from the sender, printing date in two lines. In 1961-1967 a double breakline between the address data and written message from the sender, printing dat in 1 line, for the printing house the abbrevation МПФ ГОЗНАКА. On the right side also 34 vertikal bars between address data and sender data. 1961-1967 the same, but the printing house indication is МОСКОВСКАЯ ТИПОГФИЯ ГОЗНАКА, or abbrevation. In 1964-1966 the printing house ППФ ГОЗНАКА. On the right side 32 vertikal barsbetween the address data anbd sender data. The printing-details at the bottom of the card: issued 16/III 1962, and printed by МПФ ГОЗНАКА [MPF GOZNAKA], short for МОСКОВСКОЙ ПЕЧАТНОЙ ФАБРИКЕ ГОЗНАКА [MOSKOVSKOI PECHATNOI FABRIKE], Moscow Printing Factory Goznak. Also on the right side are placed 34 vertikal bars. So a card between P 282-287. According the In HBG: Type I = P. 282-284, Green/white: P 282 or P 284 (P283 is violet/white). P 284 has an rectangle 23:30 in fluorescent yellow. So this card is P282. This postal stationery -issued 1989, September 11- has reference to Johannes Vares (Barbarus). In the travel guide of Ressi Kaera we find him in the chapter about literature: [translated from Dutch] 'In the forefront of the renewers of the Estonian literature, stand in the struggle hardened revolutionaries as J. Madarik, P. Keerdo, J. Vares-Barbarus and others'. Also Johannes Vares played a prominent political part: he was the first Prime Minister of the people's government. Later he is elected Chairman of the Supreme Soviet of the Estonian SSR. The book 'Paigallend : Ullo Paeranna romaan' , writted by Jaan Kross (1998) has as theme a concrete historical person: the doctor, poet and writer Dr. Johannes Vares-Barbares (1890-1946). But in this book Johannes Vares is disappointed in the Soviet-system and in 1946 he committed suicide. 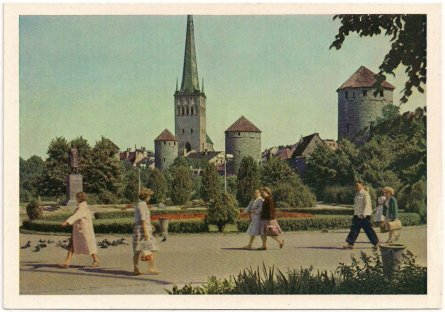 Tallinn : Stadtführer / H. Taliste. - Tallinn : Verlag Perioodika, 1978. - On cover: Tallinn : Hauptstadt der Estnischen SSR. Page 23-26: Sowjetische Bildpostkarten mit Estnischen Motiven. The imprinted stamp, resized 50 %. Type I: letterpress-printing, the lines on background and moon have more distance. Johannes Vares (12 January 1890 [O.S. 31 December 1889] – 29 November 1946), commonly known as Johannes Vares Barbarus, was an Estonian poet, doctor, and politician.